Rondele cheese was on sale last week, so I was looking for a recipe that included that. This Chicken and mushroom fettucini recipe at Just the Recipe looked like a good start. 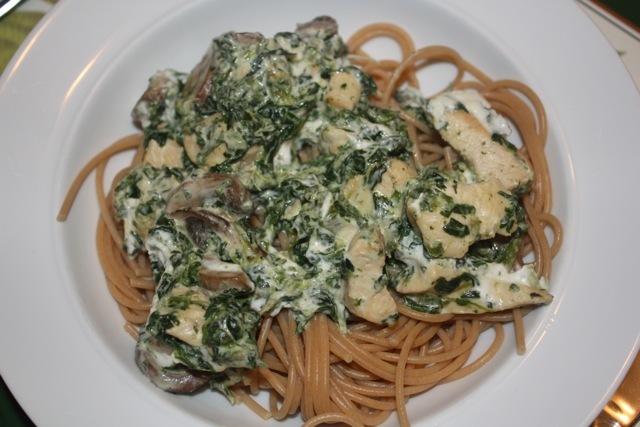 We added some spinach and used whole grain spaghetti instead of fettucini. This is also a fairly fast meal, taking only about 30 minutes or so to prepare. While preparing the pasta, cube the chicken into bite-sized pieces. Heat the oil in a skillet an saute the chicken pieces over medium-high heat until cooked through and starting to brown (5-6 minutes). Remove the chicken and add the mushrooms. Turn the heat down a bit and saute the mushrooms until they have released their water and started to brown (about another 5 minutes). While that is cooking, microwave the spinach to defrost. Drain the spinach in a strainer, using a spoon to press out the water. Add the cheese, chicken, and spinach to the mushrooms and stir to combine. Continue cooking until heated through. Serve over the pasta.